This content was originally presented as part of The State of the American Traveler – Destinations Edition webinar presented in March 2018 by Miles and Destination Analysts with support from the Southeast Tourism Society and DMA West. The Winter 2018 State of the American Traveler – Destinations Edition shows us that traveler optimism is high and people are interested in a variety of experiences, from beaches to cities to small towns and outdoor recreation, and that travelers are using a mix of resources to become inspired and plan their trips. And we’re really starting to see DMOs and other travel brands focus more on creating a mix of compelling content that not only balances inspiration and planning, but harnesses each destination’s individual strengths in innovative ways to connect with these travelers on a deeper level. We looked at a wide range of examples of destination content from around the world and, in pulling together some of our favorite examples, we saw these three key themes emerge: Visual. Social. Personality-Driven. Equally important as what you say about your destination is how you show your destination to excite travelers to want to visit – and create that emotional connection with the destination that the latest research indicates as being so important. Across the board, we’re seeing DMO content becoming much more visual and utilizing a mix of photography, video and even animations to help tell a fuller story. Travel Oregon has long been known as a destination marketer that doesn’t take itself too seriously – you probably recall their successful 7 Wonders of Oregon campaign a few years ago, and when they relaunched their custom version of the iconic Oregon Trail game last year. The state recently launched its new “Only Slightly Exaggerated” campaign. 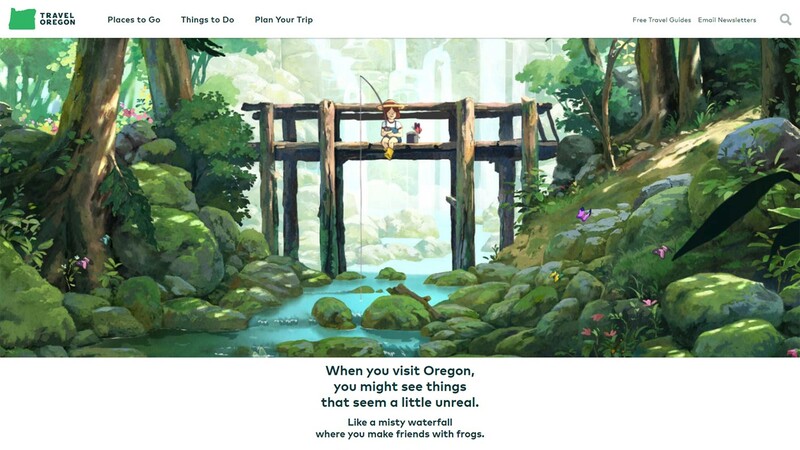 Designed to “evoke the magical feeling of being in Oregon,” the anime-inspired look and feel makes for a notable shift from typical scenic imagery to whimsical, technicolor animation. The campaign features a diverse cast of animated human characters and native Oregon flora and fauna, including a larger-than-life rabbit, a cycling caterpillar and grey whales in the clouds. While the overall vision is fantastical, each featured location is a real place you can visit in Oregon—Only Slightly Exaggerated. As seen in one of the island landing pages, the new Go Hawaii website uses visual language in a different way, layering imagery, sounds, custom patterns and textures to create a multisensory experience throughout the site. The mix of broad themes with small details really helps project a true sense of place. I like the Slovenia website because overall it really projects that sense of place I just mentioned. Subtle interactions facilitate storytelling through beautiful and clean photography and a light, fresh design. Content starts out inspirational and takes you through to planning in an intuitive way. The second key theme we’ve seen is content that is more social and pulls in multiple voices –both official and unofficial – to increase the content’s feeling of authenticity and further engage consumers. This is especially important in light of the latest research emphasizing how user-generated content and social channels weigh heavily on a travelers’ destination decision. Maine won a Mercury Award for their influencer program, which focused on bringing five Instagram photographers to travel the state for a week and document their personal experiences, which were featured in The Maine Thing quarterly digital magazine. The content focus was on genuine, authentic, adventurous experiences that align with the Maine brand. The influencer campaign resulted in a library of 750 new images –and these are editorial-style photos that align with the state’s overall lifestyle brand – and had an audience reach of more than 2.6 million. Louisiana’s ambassador program invites locals and other people who love Louisiana to become part of their Bayou Krewe and share their own Louisiana photos with the #OnlyLouisiana hashtag. The state also teamed up with local Louisiana companies like Southern Marsh to offer these new ambassadors the chance to win gear with special logos from the Bayou Krewe, which are used to incentivize program participants. 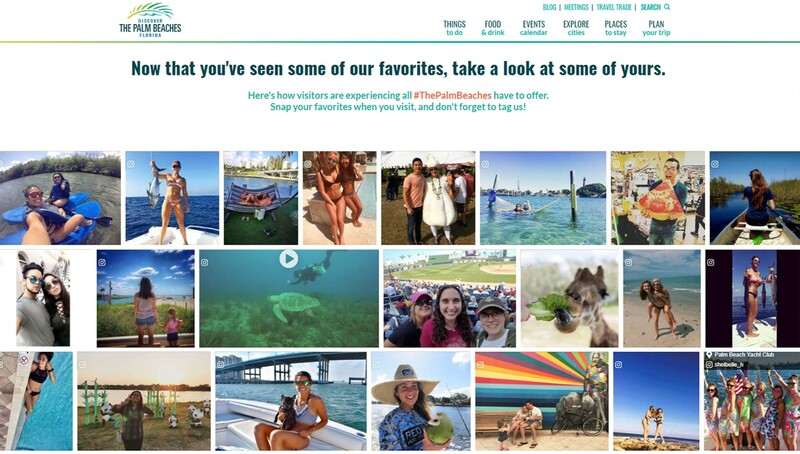 Discover The Palm Beaches utilizes user-generated photos across their website to show real people interacting in The Palm Beaches. They have the ability to curate these images by theme, interest and location across different pages of the site. Inviting your audiences to become part of your destination’s story not only fosters engagement and loyalty, but helps grow your own photography library in interesting and fun ways. The third key theme of successful destination content is that it doesn’t try to be all things to all people. Find your niche and what makes you unique, and highlight that in fun, interesting ways that will showcase your personality and will resonate with your audiences. Sometimes the best way to showcase the personality of your destination is through the people who live there. Visit Rogers, Arkansas, tapped into real locals to share their stories of why they love the destination and their favorite places to take visitors. There’s probably no other city with as many personalities as New York. 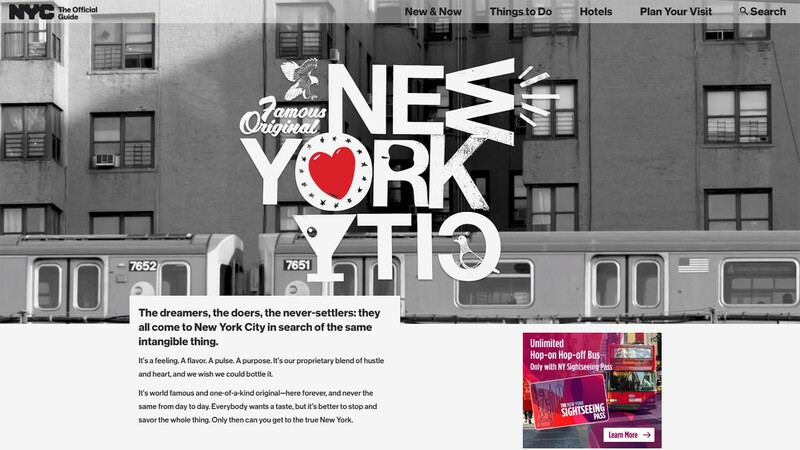 Late last year NYC & Company launched a new “True York City” Campaign designed to encourage visitors to go beyond the top selfie and bucket list places to explore and engage more deeply with the destination. It focuses on new ways to see iconic attractions as well as highlighting the city’s lesser-known neighborhoods and offerings outside of Manhattan. There’s content from local filmmakers, photographers, writers and performers all sharing what they feel makes the city so exceptional, and a #TrueYorkCity hashtag campaign to bring in additional voices. I really like the Visit Greenland site because it conveys a real emotional connection with a destination traditionally thought of as austere and remote – or maybe that’s just what I’ve thought about it before scrolling through this site. Now I want to visit. The overall content voice and consistent, deliberate photography choices reflect a youthful energy that feels real, and fresh, and makes the destination seem relatable and attainable. Branson is a small town known for its live shows that features everything from Chinese acrobats to Biblical dramas. To showcase the city’s personality, the CVB created a series of short quirky videos to reinforce the fun and surprises that are woven into a Branson vacation. Here, we see Moses—one of the stars of the local shows—visiting Branson Landing. An initial, single post on Facebook of the one-minute video organically generated almost 60,000 impressions and more than 20,000 views – which is 10-20x better engagement than the CVB’s average video post. Have you seen other great examples of digital content? Please share them with us!